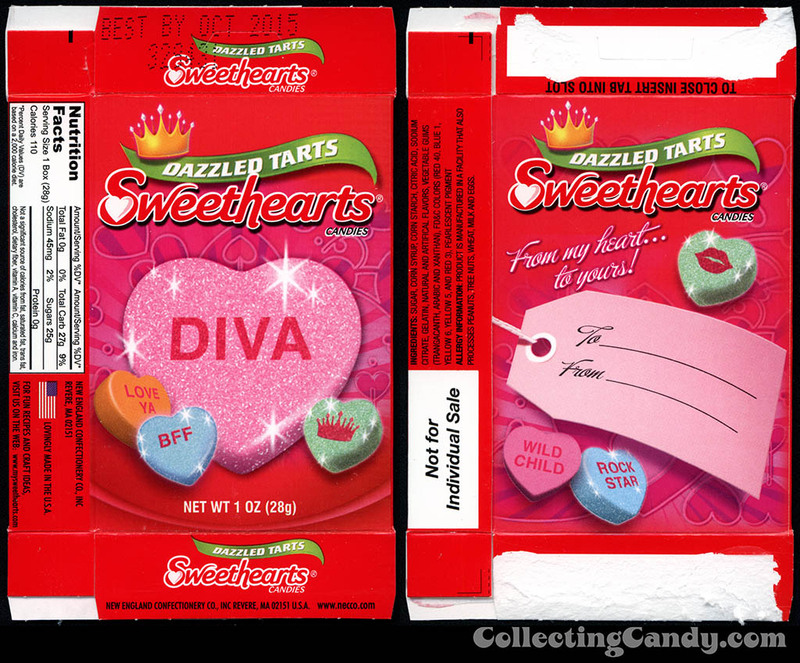 ← A Variety of Valentine Wrapper Redesigns for 2014! 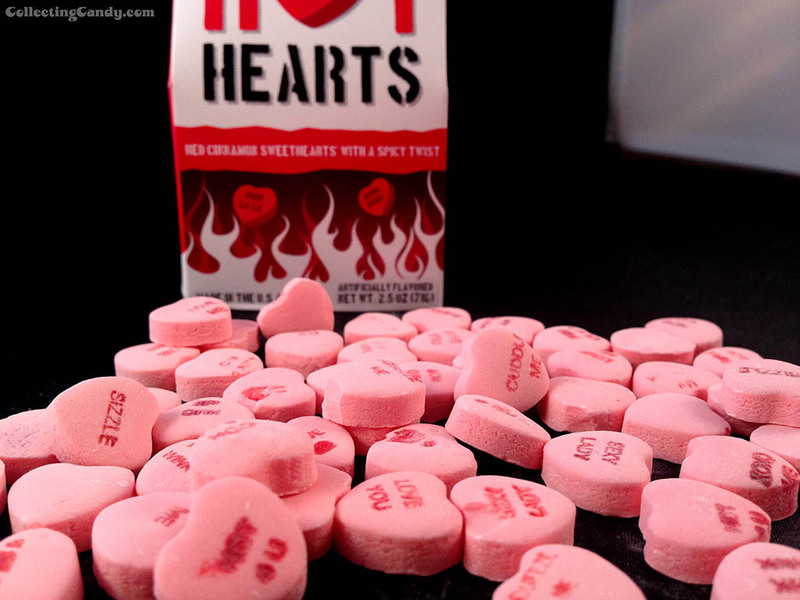 Happy Valentine’s Day with Necco’s “Hot Hearts vs. 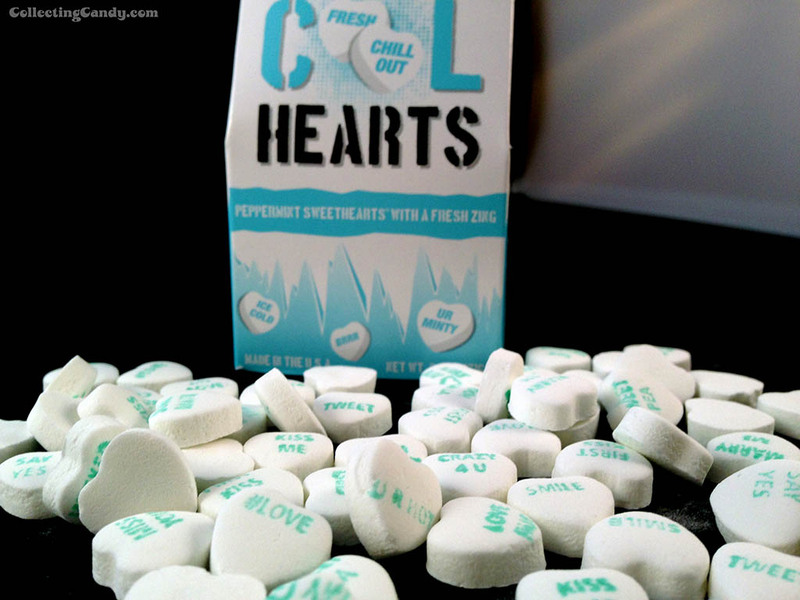 Cool Hearts” and More! 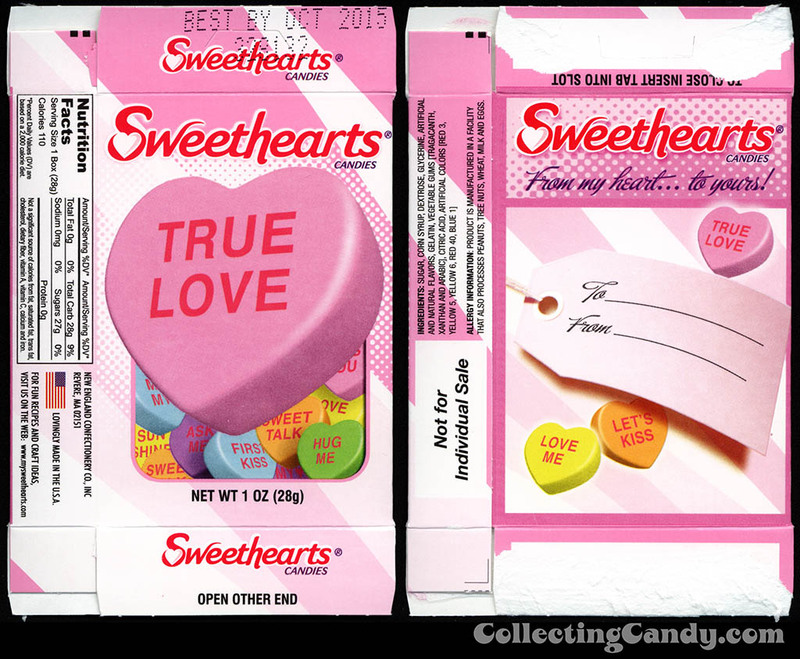 Today I’m featuring a pair of Valentine’s releases from Necco that are all-new this year. 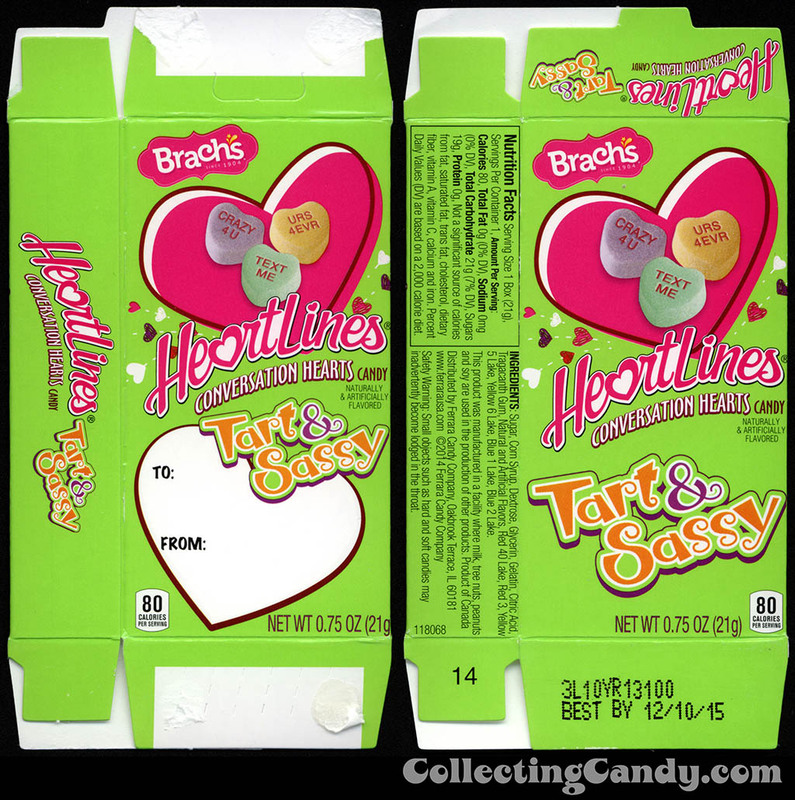 The first is a groovy take on their classic Sweethearts conversation hearts candies: Sweethearts Hot Hearts vs Cool Hearts. 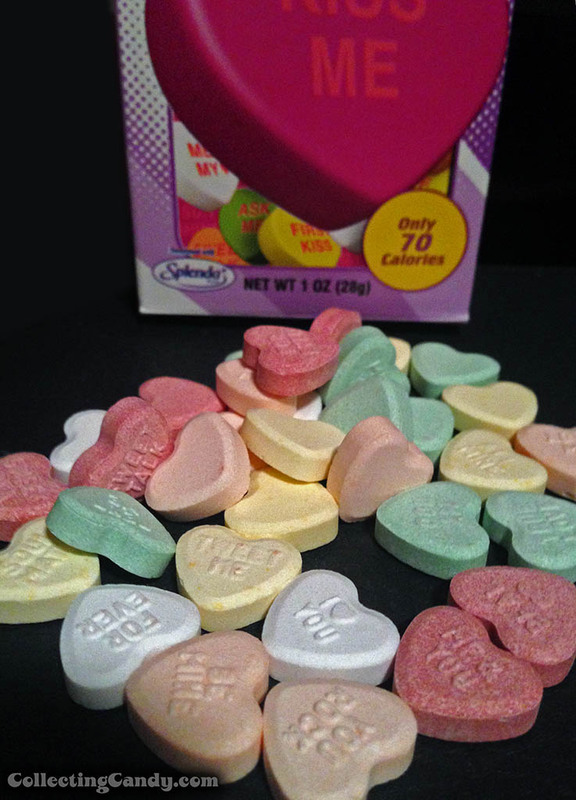 In addition to that I’ll also be showcasing Necco’s innovative new Color-Your-Own Sweethearts as well as a few other conversation heart pieces I’ve picked up since last year. 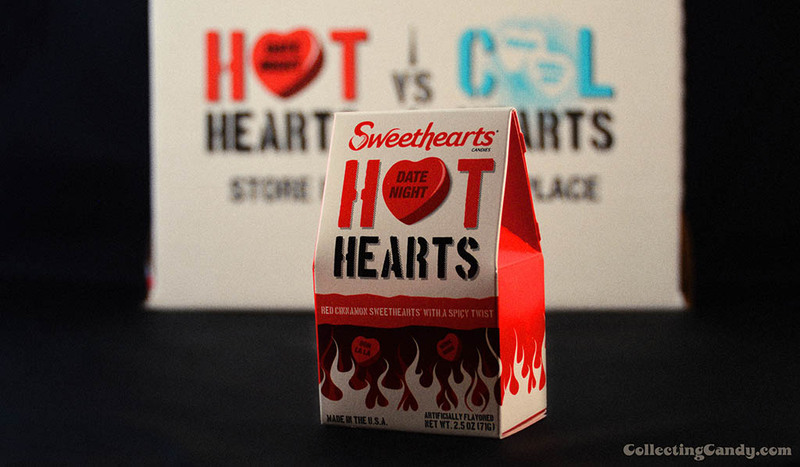 So get ready for our Valentine’s Day coverage with Sweethearts Hot Hearts vs Cool Hearts! 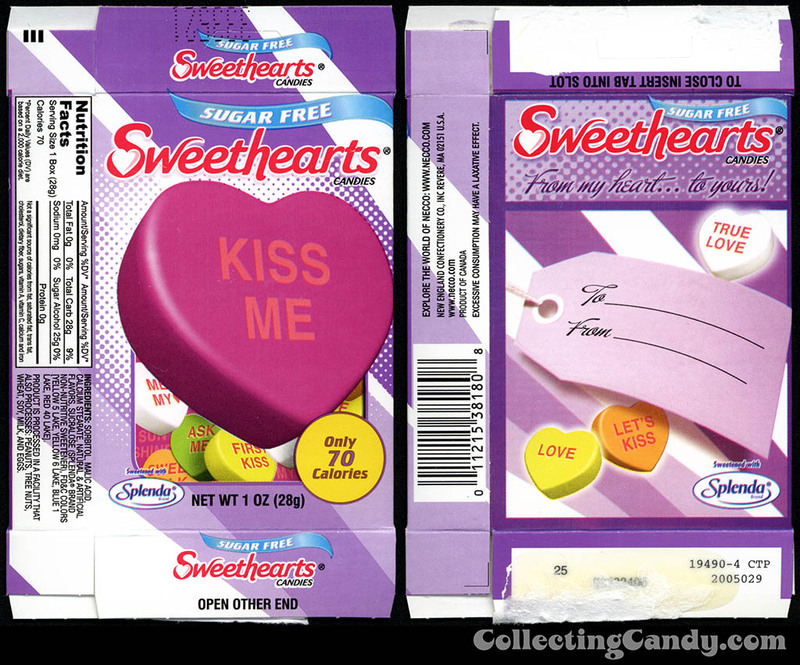 Before I get to today’s new conversation hearts releases, I want to refer to the column I posted last year on the history of Sweethearts conversation hearts candy. I consider today’s post a direct follow-up to that, so if you didn’t read it last year, check it out. It’s a great complement to today’s post. 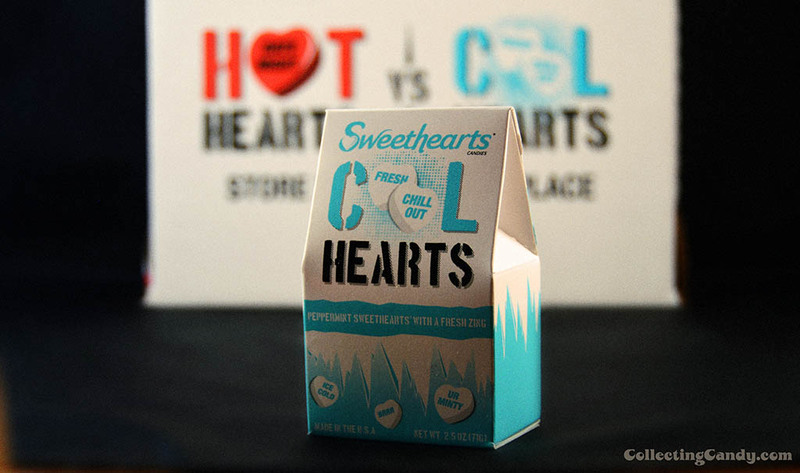 Sweethearts Hot Hearts vs Cool Hearts is a pretty awesome bit of marketing and the packaging for these is great, too. 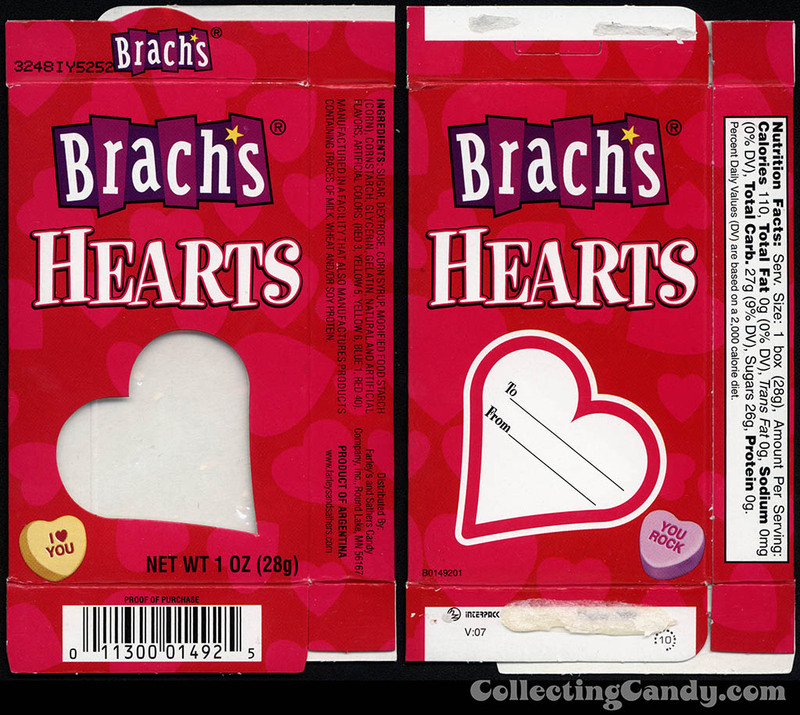 This follows a trend I first noticed last Halloween with Necco’s Batwing Wafers. 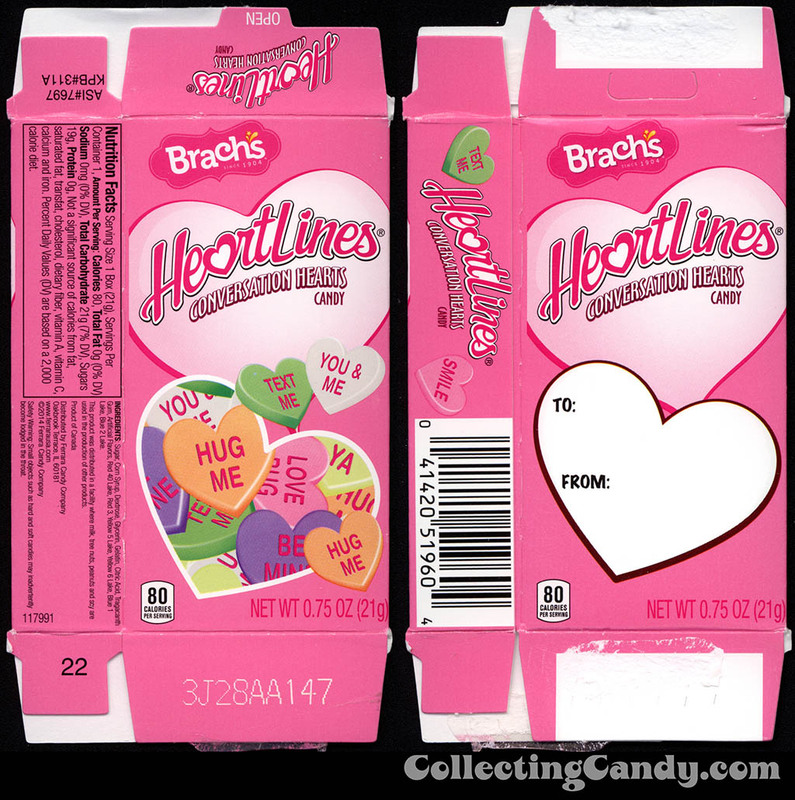 That is, in spite of Necco having such a strong history and many ties to the past, it’s been gracing the marketplace with some bold new packaging designs and fun new product ideas. 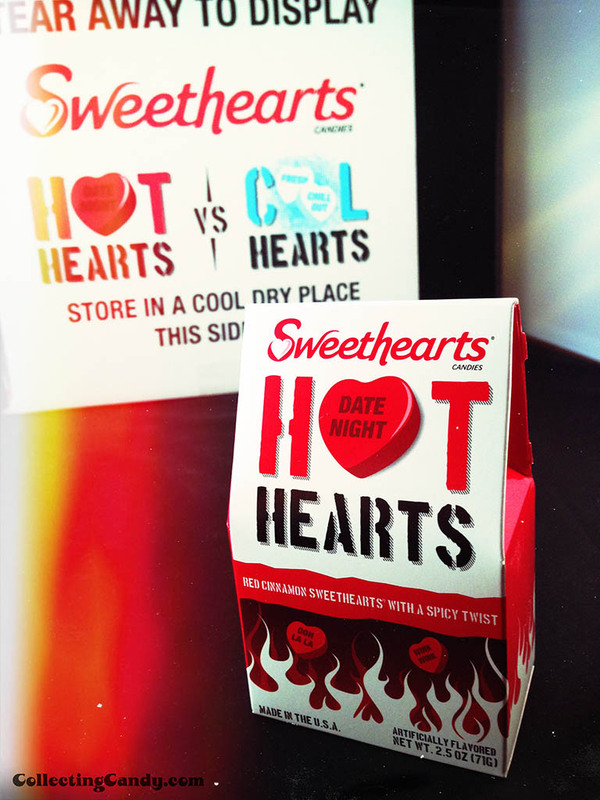 I think these Sweetheart Hot Hearts vs Cool Hearts are pretty striking, so let’s get to them. 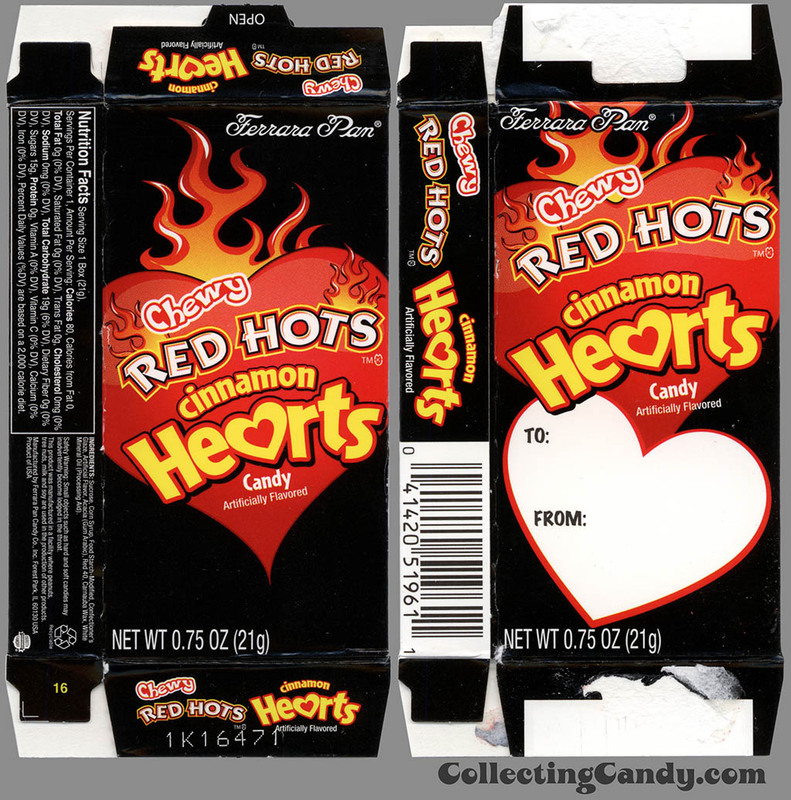 I’m especially fond of hot cinnamon candy (I dedicated a week to the subject late last year with CollectingCandy.com’s Cinnamon Hot Week) so I gravitated toward the Sweethearts Hot Hearts first. 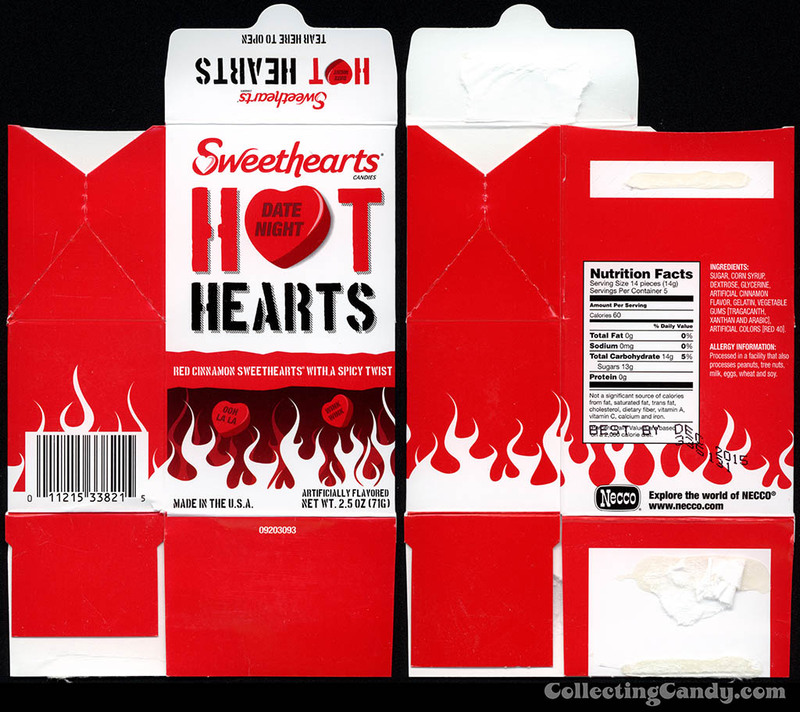 Hot cinnamon flavor candies lend themselves to fire and devil graphics, and Hot Hearts gets a flame job worthy of a 1950’s roadster. 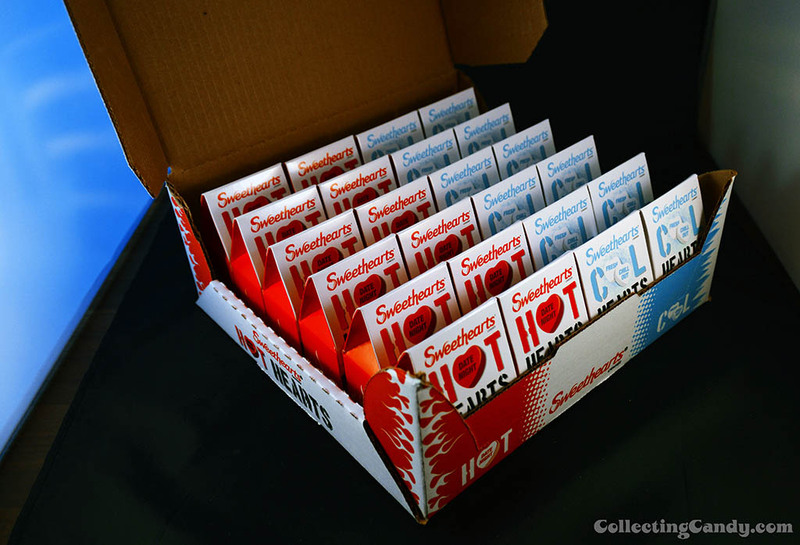 This may be the hot flavor, but boy is the box cool! 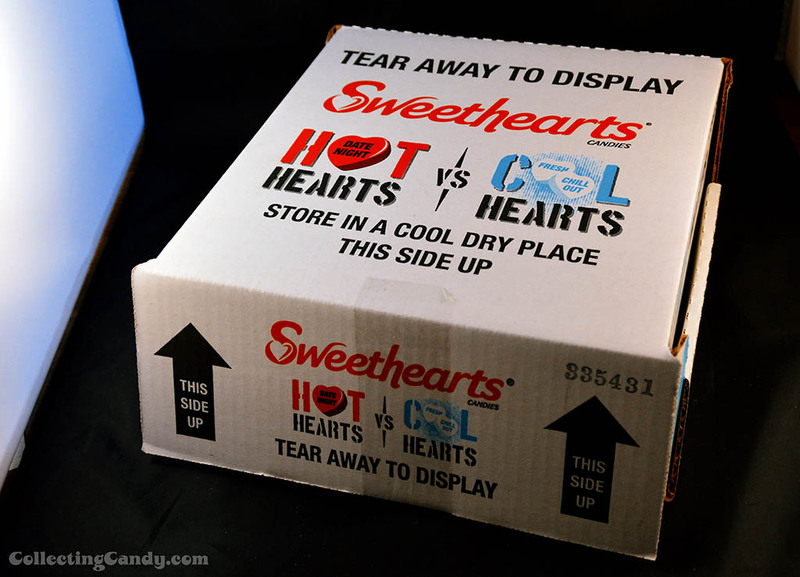 The concept here is simple enough – each Hot Hearts Sweethearts box contains cinnamon hot conversation hearts, while the Cool Hearts contains peppermint-flavored versions. 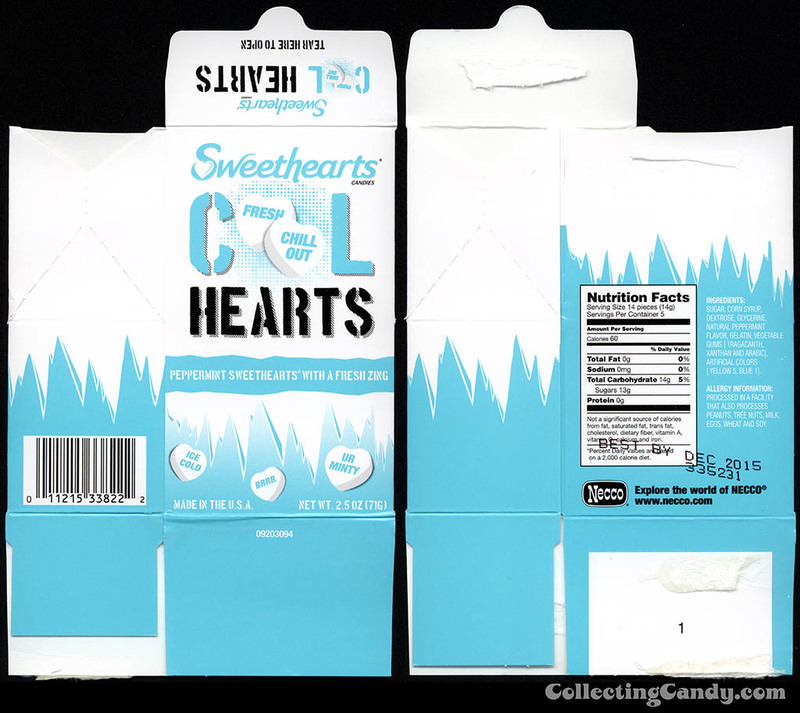 I think Necco’s Hot Hearts vs Cool Hearts is a great product featuring stellar packaging design and it’s one that has me excited to see what comes next for the company. 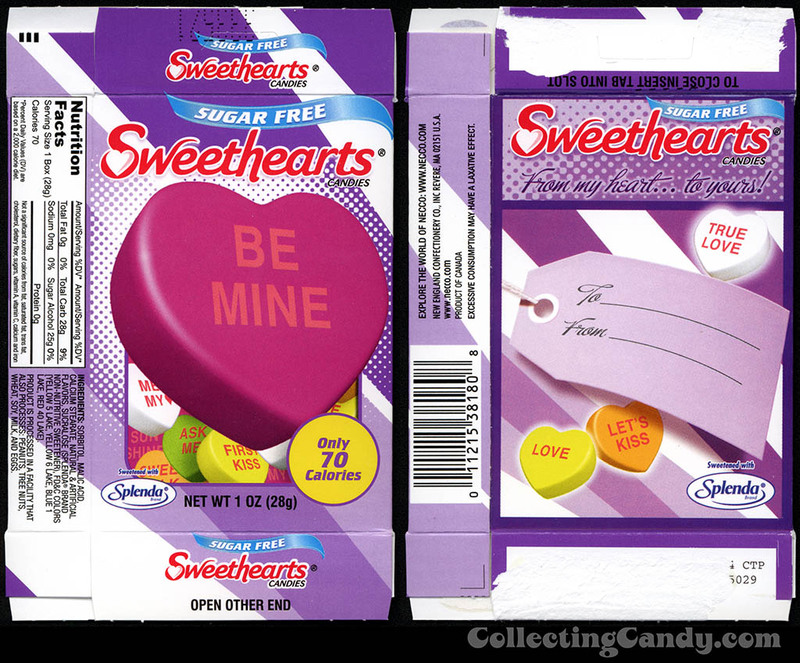 We don’t need to wait to find another innovative piece of Valentine’s packaging from Necco however, because along with Hot Hearts vs Cool Hearts they’ve also introduced Sweethearts Color-Your-Own packaging for the 2014 Valentine season! 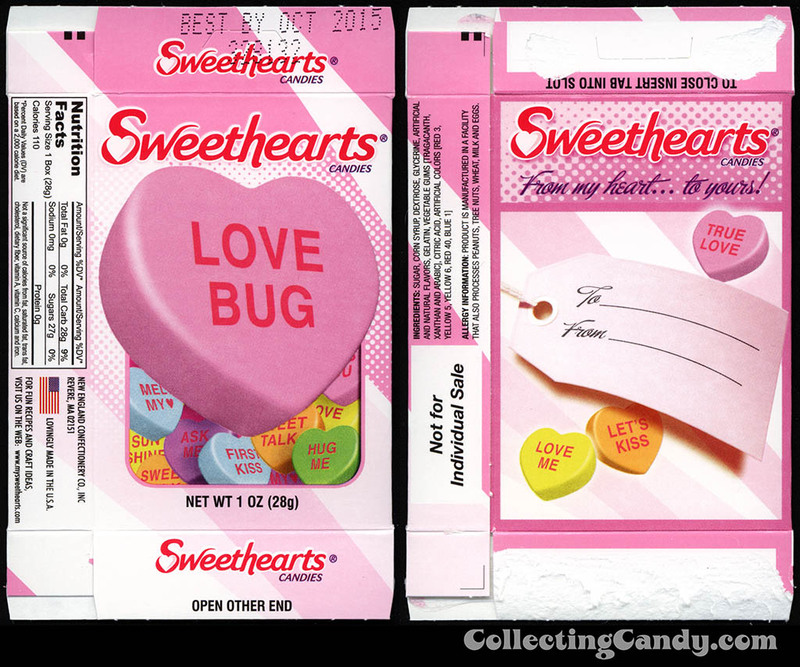 The concept here is just like it sounds – the Sweethearts Color-Your-Own box is designed in such a way to allow for easy coloring-in of the existing Valentine line graphics while leaving white space for new illustrations. I can see all ages of people getting a kick out of this, though I’d think it’s certainly going to appeal to younger kids. 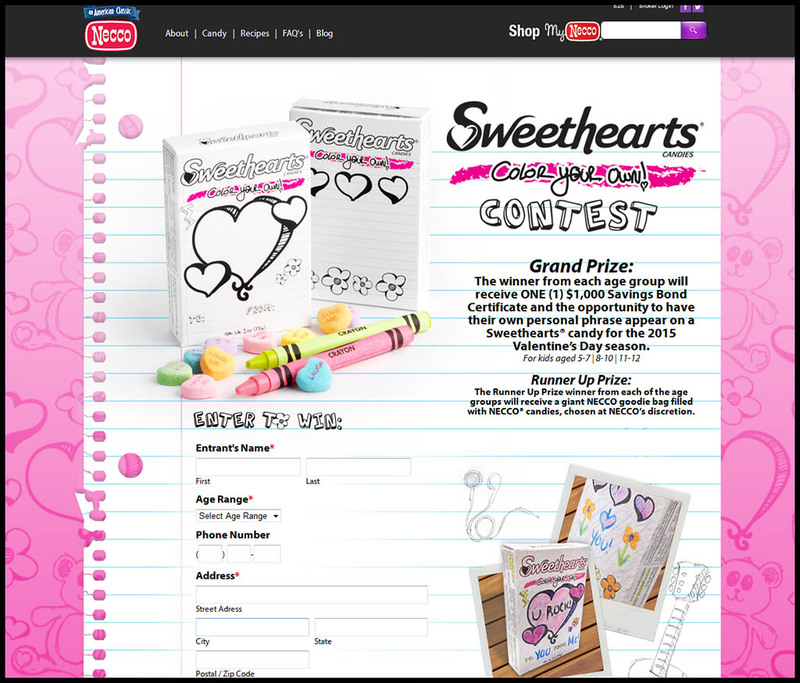 This year Necco is sponsoring a “Color Your Own” contest. Looks like a lot of fun, and I think these “color your own” boxes are an instant classic. And that’s everything for today. Happy Valentine’s Day and I’ll see you next time! 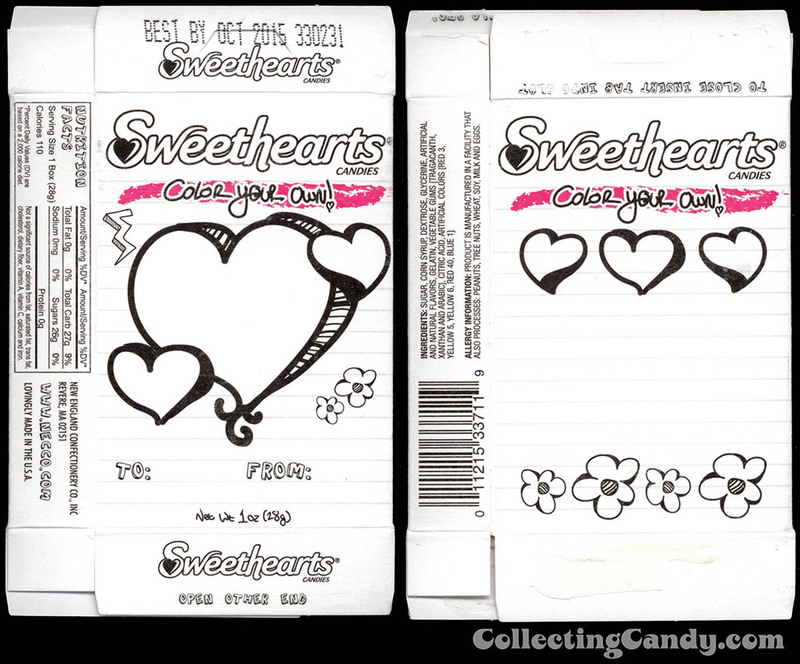 This entry was posted in Boxed, Holiday and tagged candy collecting, candy collection, candy collector, candy wrapper collection, candy wrapper collector, collectible, collecting candy, confectionery, confections, conversation hearts, hearts, hot cinnamon, Necco, New England Confectionery Company, packaging, packaging design, Spanish, sugar-free, Sweethearts, sweets, vintage candy wrapper, wrapper. Bookmark the permalink.